This lesson brought to you by Eric “Hot Dog” Moore. Asteroids, a part of the game most players would rather do without. They’ve been known to cause lost actions, lost hit points, lost ships, and the occasional bout of ‘roid rage. But, there they are none the less, so you might as well make the most use out of them. 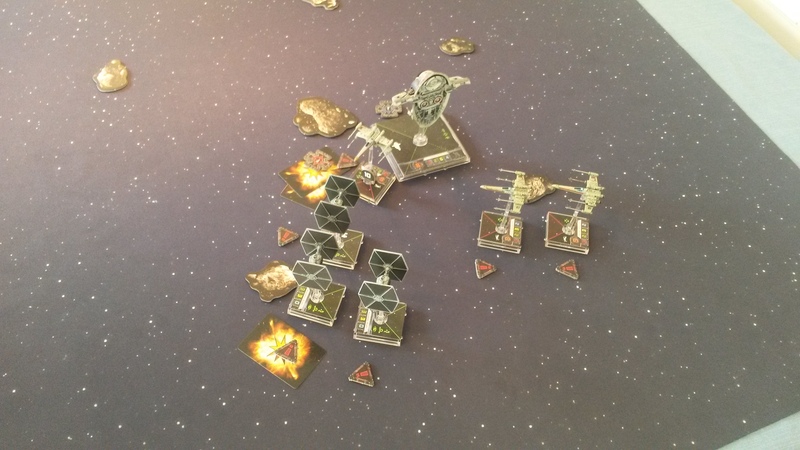 This lesson will cover how to make the asteroids work for you in the first few rounds of shooting. Let’s start with a pretty basic set up. 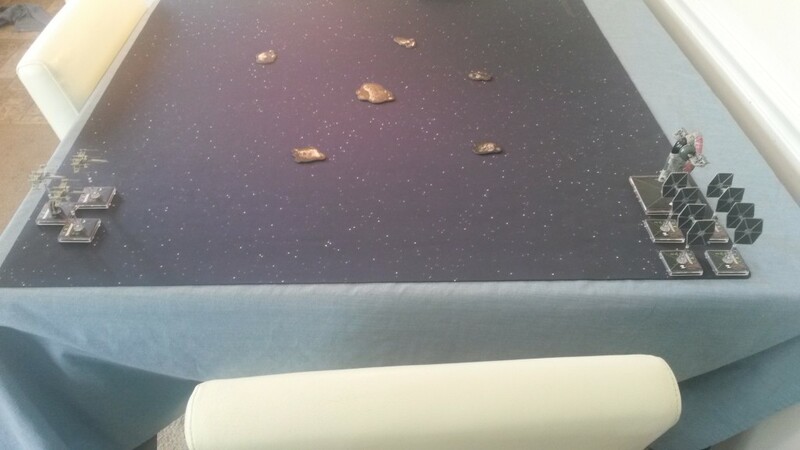 Cluster of rocks in the middle and the Imperial fleet forms up in the corner. 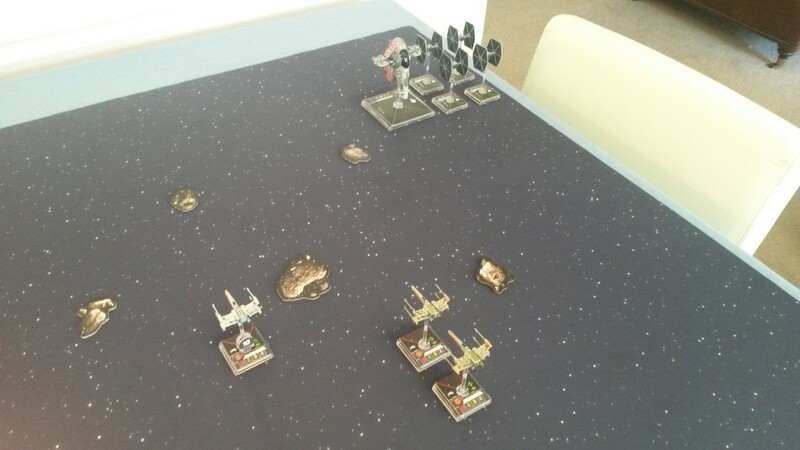 One option the Rebels have is setting up directly across and preparing for a joust. 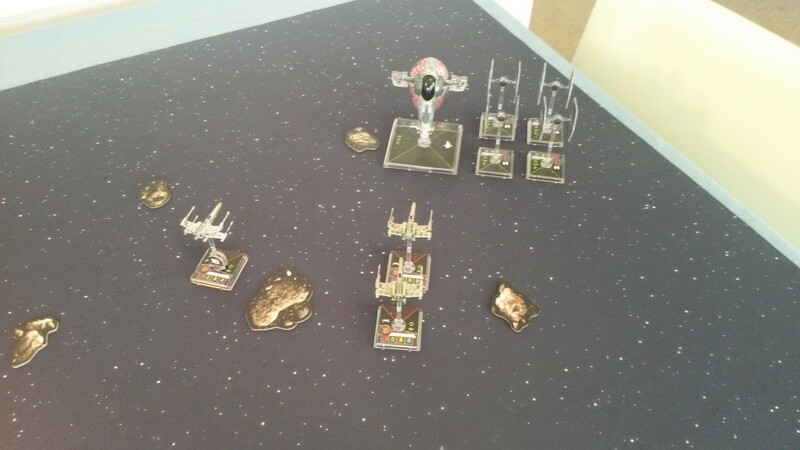 Following the initial joust, the X-Wings (with some damage) and TIE Fighters (minus 1) K-turn, and the Firespray makes use of his rear arc to keep getting shots and not lose an action. This next round of combat is going to be very bad for the Rebels. 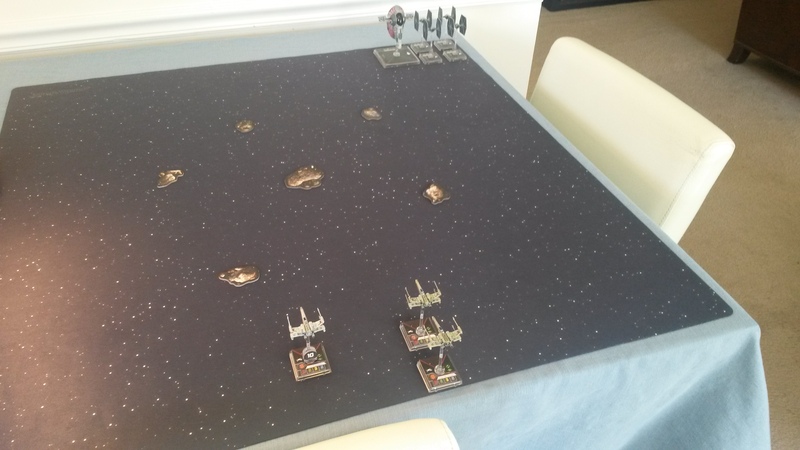 They’ll probably kill another TIE, but lose an X-Wing in the process. The Empire really likes that trade. An alternative would be to set up in the far corner and rush around the asteroids. The hope would be to draw the Empire through the asteroids, breaking up their formation. 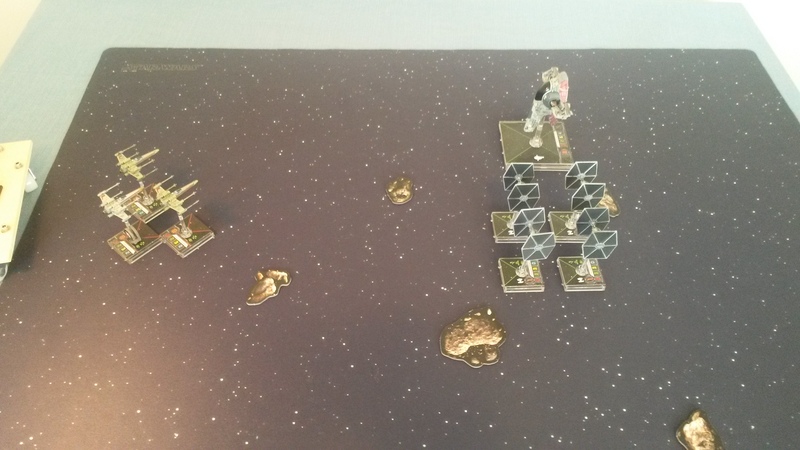 As the X-Wings start to make their turn, the Empire does indeed brave the asteroid field. But, any decent player can handle that when they’re not worried about being shot at. The ships meet head on. Thwap! Thwap! Thwap! Now the situation is even worse for the Rebels. They drop one TIE, take some damage, and at least the rocks forced one TIE to turn and lose his shots. 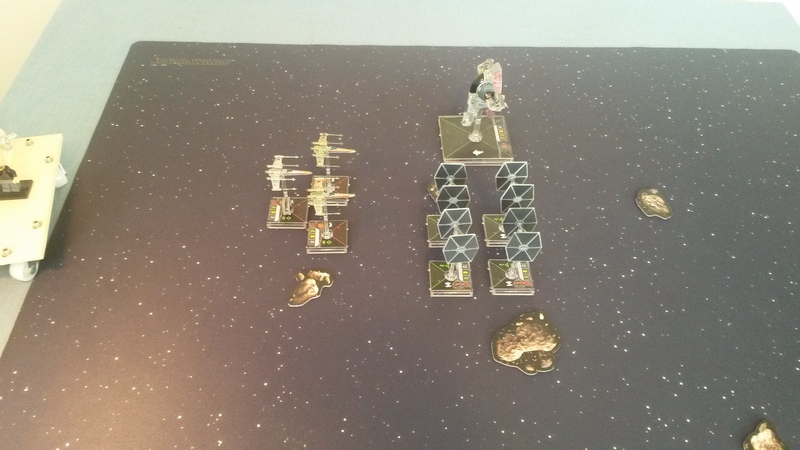 But, the X-Wings are in even worse position. 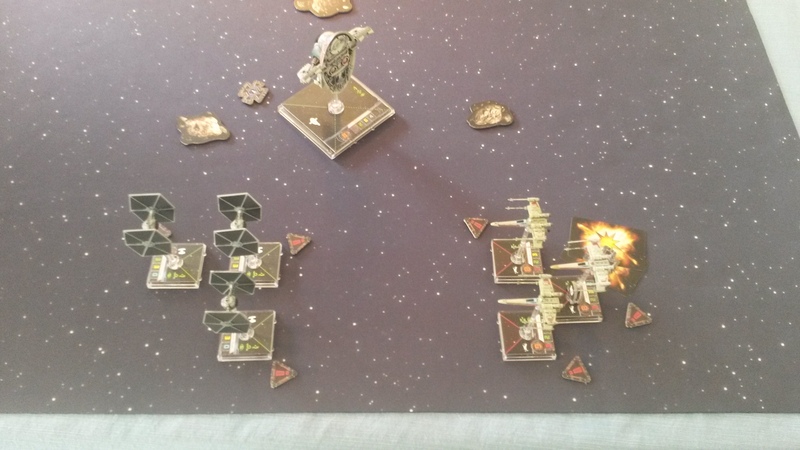 One TIE facing the wrong way is bad, but one X-Wing facing the wrong way is a disaster. The Empire really likes this one. With multiple K-turn options plus a barrel roll, TIEs will always perform better among the rocks. So now for the third option, setting up to fly directly into the asteroid field. 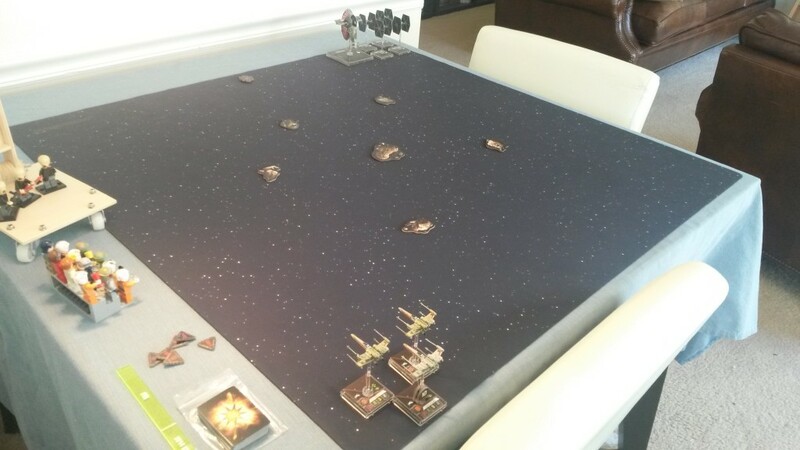 Even the humble X-Wing can work its way through an asteroid field when there’s no bogies around. Once again the ships turn to face each other. This time, the result is going to be completely different. 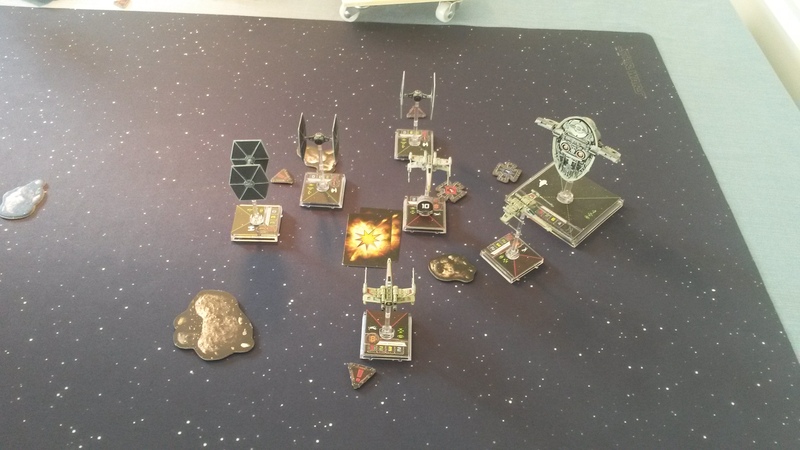 The damage in the initial round of shooting will be the same, but the TIE Fighters found themselves with very limited options. The X-Wings were blocking the only good path, banking towards the edge doesn’t help, so they have to K-turn into the asteroid field. Sure the TIEs have multiple K-turn options, but your options get cut down very quickly when you have to account for asteroids on top of enemy ships and your own formation. Advantage goes to the Rebels. If you’re flying out of the asteroids as you start combat, this means your opponent will be flying into them (doesn’t apply to turrets). They risk taking damage, losing actions, losing shots, breaking up their formation, and they have fewer choices about which target to focus their attacks on. By flying out of the asteroids, you can turn anyway you want and K-turn with ease. That initial combat moment is what you want to focus on. Fly into the asteroids early so you can fly out of them when it really matters. If you found this content useful, please consider contributing to my Kickstarter. There’s still a bit of time left. Good lesson. I find the constantly changing camera angles a bit disorienting though. Maybe try a top down approach? I just hadn’t thought about the angles until I posted it. In person, it’s easy to keep track of how things are positioned as you move around the board, but I hadn’t considered that not translating to the web. Definitely something I’m going to pay attention to in the future posts. Great idea about flying out of asteroids! You’ve earned your kickstarter dollar from this grateful patron, sir.